The world’s population has just passed 7.5 billion, according to the ‘World Population Clock’ hosted by worldometers.info. Worldometers uses projections based on a variety of highly reputable sources to calculate its constantly updated numbers, including the United Nations, the World Health Organization, and the World Bank. The planet’s population passed the halfway point to the next billion on 25th April 2017, representing a net addition of more than 25 million people since the start of 2017. More than half of the world’s population today is aged 30 or under, according to data from the United States Census Bureau. Nigeria has the youngest population in the world, and more than half of the country’s 189 million residents are below the age of 15. Conversely, Monaco has the world’s oldest population, with more than half of the city-state’s residents over the age of 50. There are approximately 65 million more men than women alive on Earth today, according to the latest UN figures. American Samoa has the largest gender ratio difference in the world, with roughly 1.36 men for every woman. At the other end of the spectrum, Haiti has the smallest gender ratio gap, with just 1.01 men for every woman. China has the world’s largest national population, with the latest government figures indicating that the country’s population now stands at more than 1.385 billion. However, the United Nations expects India’s population to overtake China’s within the next five years. India’s population is currently growing by more than 15.7 million people every year, accounting for more than 20 percent of the world’s total annual growth. Meanwhile, just 20 countries account for 70 percent of the total world population. The global population story isn’t just about the big numbers though; the world’s smallest recognized country – the Pitcairn Islands – has a permanent population of just 50 people. The UN reports that the world’s population is currently growing at a rate of 1.11 percent, which translates to growth of about 80 million people each year. 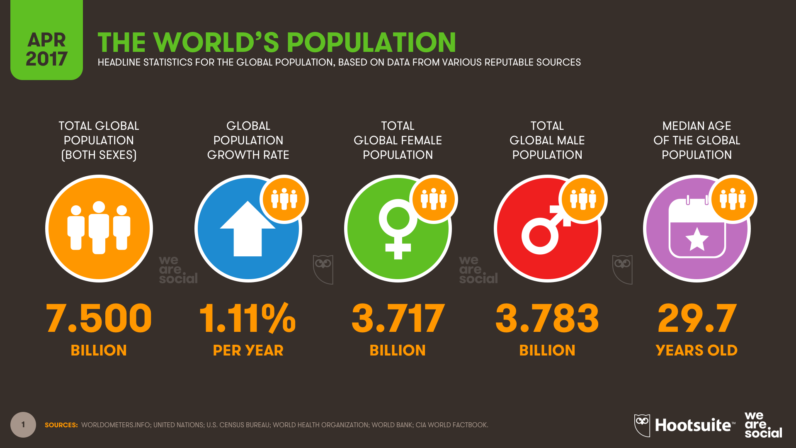 At current rates, the world’s population should pass the eight billion mark sometime in 2024. For context, the global population only passed its first billion in the early 1800s, and only reached the five billion mark as recently as 1987 (just 30 years ago). It’s not just newborns that are contributing to this growth though; more of us are living longer, too. Worldwide, the average life expectancy for babies born today sits at 71 years, but women are likely to live roughly five years longer than men. Japanese people can expect to live the longest, with the average national life expectancy currently sitting at 83.7 years. But the good news is that – regardless of how many of us there are on the planet – every one of us is still unique.